Traditionally, folks tend to place a double, queen-sized, or king-sized bed against the center of the wall opposite the main door to the room. With this arrangement, the headboard is the center of attention as you enter the room. If the dimensions of your room prevent you from positioning your bed on the wall across from the door, other possible choices depend on which walls are long enough to accommodate the bed. Diagonal placement works well when you have the space. Do not place a bed under a window, if the window will frequently be open. Open windows can create uncomfortable drafts. Positioning a bed between two windows, however, works well. If your home is air-conditioned or heated year-round and the windows are seldom open, you may be able to ignore this rule. Do not place the bed where it obstructs a door into the room or a walkway through the room. Consider nontraditional furniture arrangements if doing so will free up space or use space in a more interesting way. For example, a bed may look dramatic placed in front of a secure window; on a diagonal, which takes up extra space; sideways along a wall, to maximize floor space; or in an alcove (a technique called lit clos). If your closet is large enough and you’d like to free-up floor space, put your chest of drawers inside your walk-in closet. Doing this will let you add additional pieces of furniture, such as a writing desk, a seating group, or a big screen TV, to transform any bedroom into a luxury suite. Bedrooms used by a specific group of people have unique needs. 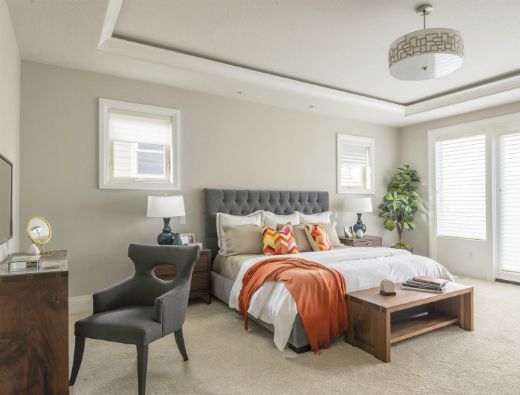 Whether you’re decorating a master bedroom, a guest room, or a room for children, the following sections provide you with the tips you need. Make the bedroom look larger by eliminating clutter. Use only necessary furniture. If you can, push a chest of drawers into a walk-in closet to free up floor space. Keep the bed visually low. Use a headboard, but don’t use a footboard, and opt for something other than a four-poster bed, all of which tend to take up space visually, making the room seem smaller. Keep all your furniture — like the rest of your color scheme — light. Light colored furniture, walls, floors, window treatments, and bedding make a room seem bigger. Add bedside tables that are as big as space will allow. If you read or watch TV in bed, you’ll find these tables helpful. You can buy restaurant café tables for very little money and drape them with quilts. Try to make room for at least one comfortable chair. Chairs are great for company on a sick day, for daytime resting, or for reading. Consider carpeting all bedroom floors to reduce noise in the room. Add a lady’s desk — a small, delicately proportioned furnishing for writing letters and so forth — if you have room. Teenagers usually know what they want in a bedroom and aren’t slow to tell you that they need storage for books and music and space for their collections of just about anything you can name. They have firm ideas about style and colors, so ask! And when your son or daughter requests a wild color, do your best to persuade him or her to use it as an accent. More and more activities from surfing the Net to entertaining take place in a teen’s room. Extra seating and small tables provide space for visitors. Keep furnishings practical and easy to care for. Keep cribs away from windows and window blind cords. Make sure cribs and bunk beds meet federal safety standards. Check to see that mattresses fit snugly against the crib’s sides. Slats, spindles, rods, and corner posts should be no more than 2-3/8 inches apart from each other. Make sure a child can’t release the drop side of a crib. Choose chests and cabinets that can’t be tipped over (even when drawers are opened and a child crawls up and into them). This may call for fastening them to the wall for security. Find hardware that’s rounded, sanded, and has no sharp edges. Equip all electrical outlets with plastic safeguard plugs. Eliminate any small throw rugs on slippery floors. Make sure all flooring is skidproof. Eliminate dangling cords on window blinds. Choose bunk beds with sturdy ladders, handrails, and safety rails. Make sure you have a guest bed for occasional sleepovers. A trundle bed, which neatly stores a second bed beneath a regular one, is the ideal solution for children’s rooms. Buy a handsome, space-saving daybed or sofa bed that fits smartly against the wall and out of the way. The versatility of these beds makes them a delightful option in a home office or other double-duty room. You may even consider installing a Murphy bed that hides away in a closet. Make sure that your guest has plenty of closet space. Dedicate two sets of sheets, a comforter, special pillows, a duvet cover, and pillow shams to your guest room.